"We're kind of a weird band," admitted Crawdaddies guitarist Chris Huntington. "We can go from ska to country in a set" - not to mention reggae, zydeco, conjunto, and rootsrock in between. The eclectic veteran Baltimore aggregation probably rankles the purists with its endless fusions, but accordionist Kraig Greff, the Crawdaddies' sole remaining founding member, could not care less. "Look, this is more of a party music where the whole thing is to keep people dancing and switch up if something isn't working." Besides levying a blistering attack on guitar, Huntington serves as the group's chief songwriter. His process of crafting tunes seems simple enough: First pen the lyrics, then center a style and arrangement around Greff's accordion. 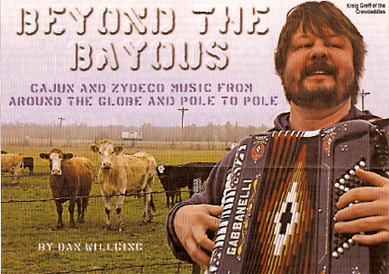 It's worked so far; the Crawdaddie's sophomore disc garnered third place for best Cajun album and second place for best Cajun song ("Gimme Some") in the Just Plain Folks Awards, an industry consortium of indie talent. The group's third disc, Keep Lookin' Up, finds it once again skanking heavy on the one-drop and juxtaposing styles to infectious melodies. The disc's whacked-out last song comes as a total surprise. First, mommy dearest advises her drunkard son to find a woman to straighten out his life. When he finally does, she robs him blind, including absconding with the mutt. The chorus repeats "find yourself," then seemingly, the song is over. After seconds of silence, the song and the protagonist return, only this time, he tracks her down and fills her full of lead. By pleading insanity, he receives a light sentence, and once again, the chorus “Find yourself” comes on.